35 years ago today, my entire world changed. Even now, I think of my life in terms of BCBefore Caroland AWMAfter We Met. 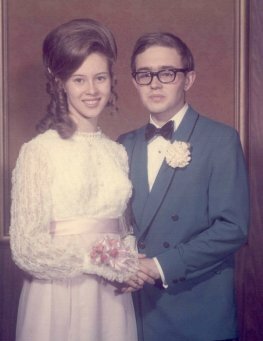 The photo is from Carol's high school prom in May 1970, but it shows us pretty much as we looked in that era, on that most fateful night. I spent much of the Summer of Love in my mother's garage, tearing apart the mountain of broken radios and TVs that my neighbors had unexpectedly given me in response to a free ad that I had placed in the little shopping news sheet that showed up in our mailboxes every Wednesday. And that was where I was early in the afternoon on Thursday, July 31, 1969. I had a line of beer boxes arranged in a semicircle, one for tubes, one for resistors, one for capacitors, one for transformers, and one for none-of-the-above. Snip-snip-snip went my dykes (which is what we really called them back then) and the boxes filled, hour by hour. About two PM my best friend Art Krumrey rolled up our gravel alley on his bike, and told me that there was a Teen Club coffeehouse down at the church that night, and that we both should go down there and meet some girls. He was without a girlfriend at that point, and it was becoming increasingly clear to me that my girlfriend Marianne was becoming increasingly impatient with my eccentricity, and was sticking with me because there was nobody else on the horizon for her. I protested that there were still a lot of TVs on the pile, and that I wasn't especially good at meeting girls without formal introductions. Every girl I had ever dated up to that point had been a blind date or setup of some kind. Nonetheless, Art (as was his habit) twisted my arm until I shrugged and said, Oh, all right. And at 7:30 PM we walked down the parish hall stairs at Immaculate Conception Church on Talcott Road and surveyed the territory. Art wasn't pleased with what he saw. "These are all freshman girls," he said, as though that disqualified them utterly. I had come under protest, but now I was warming to the idea. Maybe freshman girls would look upon an eccentric high school junior with something other than disdain. Art continued down the stairs and vanished into the throng, searching for girls who (like us) would be entering their senior year in another month. I mostly wanted a girl who would genuinely like me, and wouldn't object to my peculiar enthusiasms. (Electronics, astronomy, science fiction, kites.) This had been a problem with my first three girlfriends, and I was beginning to wonder if it was inevitable. Art was wrong. These were not all "freshman girls." Tom Clark, who had been in my eighth grade class, was sitting close by the stairs, along with Jackie Ropski, another girl from my grade school, who was frighteningly good lookingbut hey, there were other girls with them, and Tom and I had been friends in grade school. (Sort of. A little. In third grade.) So I sat down next to Tom as though he were my long-lost brother, nervously said hi to Jackie, and looked around. Ulp. I was sitting next to perhaps the most beautiful girl I had ever seen, anywhere, ever. Perhaps because of where I had chosen to sit, Jackie introduced me to her good friend from Resurrection High School, Carol Ostruska. Carol was quiet by nature, and I was dumbstruck to be beside her, so there wasn't much conversation between us as the time went by. Topics floated past us, carried by the voices of others there: Pop music, sports, summer jobs, parties, movies...and I was lost in the thick of a culture I had never strongly bonded to, wondering what to do next, and hoping that whatever it was, it would involve this remarkable young woman sitting only a few inches to my right. Art came back about then, and, untroubled by shyness, sat down in the thick of our group and took up a leading role in the conversation. He seemed interested in Carol; in fact, once introduced (again, by Jackie) he appeared to be searching for a conversational opener. The topic at hand was movies, and somebody was talking about the musical Oliver, and after that some art film I had never heard of. And then, unexpectedly, Carol spoke up: "Has anybody seen 2001: A Space Odyssey? It's supposed to be really deep, but I haven't read anything good about what it's supposed to mean." Art opened his mouth. No way, dude! I had already seen 2001 five times. Art hadn't seen it yet at all. And so, teetering on the edge of panic and exhilaration, I seized the moment: "Sure. It's about transcendence, and humanity's search for a higher power..."
Right then the folk singer returned from his break, and began his cover of "Let's Get Together," the iconic song of the summer of 1969. Against that, my response faded into the noise, as all heads turned toward the singer and, with his encouragement, many joined in. I leaned over to Carol, and, heart in my throat, said the bravest and most pivotal thing I have probably ever said in my life: "Hey, there's more to it than that, but it's hard to explain in just a few words. If you're interested, we could go see it, and then talk about it more over a pizza." She smiled, and nodded, and in the next few minutes she gave me her phone number, and we agreed that Saturday would be good. Saturday was good, as was the Saturday after that, and the one after that. I took her out flying a kite I had made, and she didn't gag. I spoke of science fiction, and explained how equatorial telescope mounts allowed telescopes to follow the stars, and worked harder than she ever knew at being "normal." (Case in point: I hated pizza...but figured it was damned well time I developed a taste for it.) I was by no means the first or only boy she ever dated, but she kept coming back to me, because I had a kind heart (I typed all her senior-year term papers on my electric typewriter, at 80 WPM) and engaged her in interesting conversation. Our early relationship fell a little outside the tragicomic teenage dating template in many ways, but that allowed us to be friends without completely prohibiting the romantic feeling between us that grew slowly as first the months and then the years passed. I drew her out of her shyness; she drew me out of my eccentricity. I wrote her passionate letters, and made her laugh; she encouraged me to believe in myself, and taught me to dance. Somewhere in the middle we fell in love, and persevered as best friends across 35 years of time. Had we not met, we would now be strangers, not only to one another but to the people we ourselves would have become. Jeff without Carol is now basically undefined; no more meaningful than dividing by zero. You cannot love truly without allowing yourself to be changed, and if you truly love a person, the changes you make in them cannot but be for the best. Maybe it's luck; maybe it's skill; maybe it's gracebut whatever it is, we are both thankful that we took a chance, and let it happen, in that church basement so many years ago. Heading to Chicago later this morning. The next few entries here may be a little late, and a little thin. I should mention that the first year of Contra (July 2000-June 2001) has now been day-anchored, and the photo index is current to June 2001. The latest Nuts & Volts has a wonderful article (not online) about building a stereo amplifier for your PC sound cardwith tubes. The tube is the 6T9 Compactron, which puts a triode driver and pentode power amp into the same envelope, sitting on 12 pins. I've used the 6T9 many times, at both RF and audio, and in fact posted a photo of a simple 6T9 audio amp here in Contra. It's a fairly simple circuit and should be easy to build, though the tubes are the least of it in terms of cost. You'll need a power transformer and two output transformers, and these will set you back $60 alone. Nor is there any promise that tube audio sounds better than solid-state audioit's a ridiculous quibble, actually, given the state of today's music. Every nerd should build something useful with tubes at some point in life. Here's your chance. The same issue of Nuts & Volts has a fine article on Hugo Gernsback, who more or less coined the term "science fiction" and was one of the first people to ever use the term "television." We owe more to Hugo than most of us realize, and by the temper of his ideas and inventions, I'm sure he'd fit right in to our modern-day nerd culture. A stray thought: From the standpoint of the Linux desktop (and not all the geekoid stuff under the covers) is there really only one Linux? I'm seeing increasing divergence in all those things through which Linux meets the user: The installer, the UI, the installed suite of apps. If software monoculture really is a threat (and I think it is) then this is a good thing. But for those who want a universal drop-in replacement for Windows that everone understands and uses identically, well, this is a slow stroll in entirely the wrong direction. One book can well be called Mastering Windows XP, but it will take a whole shelf of books to do the same job for Linux. (Mastering Fedora Core, Mastering SuSE 9.1, etc. ) This may not be a bad thing, but the industry is in serious denial over it. All subdivisions have rules, most of which are petty or even silly. One of ours seemed a little odd to me, but I was struck by the emphasis people put on it: Don't take out your garbage can in the evening for morning pickup. Last night we found out why. It was a cool summer night, and Carol and I left the sliding glass door to the bedroom deck open. At 4:30 AM I awoke to a loud banging and clattering. I grabbed my robe and ran out on the deck, to look down Villegreen and see, in the light of a single streetlamp, a black bear rummaging through a neighbor's overturned trash can. It was a big canone of those 100-gallon wheeled jobs they favor around hereand the bear was bigger than the can. Carol and I stood out on the rear deck for twenty minutes, watching a tableau worthy of a National Geographic special on urban wildlife. The bear was pawing through a pile of garbage, ripping open white plastic bags, scattering empty milk jugs and soda bottles in all directions, and making a tremendous mess. After a few minutes a red fox crept in slowly from behind, sniffing around and probably hoping that the bear had scattered a few morsels outside swatting length. The fox circled arund behind the bear, sniffing and peering longingly at the pile of trash. At one point the bear heard (or smelled) the fox and whipped around, pursuing the fox briefly into the shadows beforen returning to the trash. The persistent fox returned twice more, only to be chased away each time. Just before 5 the rule-violating homeowner opened his garage door and rolled out in his Subaru on his way to work. The bear and fox scattered in opposite directions, and we didn't see them any more. This was just a day after we looked out the guest room window and watched three baby skunks cavorting in the underbrush between our house and the next one. I have seen as many as 11 deer at a time in Ross's front yard next door, downing his weeds with relish if not mustard. We frequently watch hawks circling above the neighborhood from our back deck. I guess this particular rule is there for a reason: We're not the only major mammals inhabiting the area. It's a little scary. I'm glad our decks are 20 feet above the hillside. In the archive file names, months are spelled out, in lower case, followed by the full year; e.g., 2000, 2001, 2002, etc. The named anchors within archive files use the form MM-DD-YYYY. Note that although I am inserting named anchors in my three-month current file Diary.htm, it's futile to link into any specific entry within Diary.htm because the content passes through it as a rolling three-month window. Insert named anchors in all the archive files, starting with 2000 and working forward. Each time a year is anchored, I'll index all the photos for that year. After all archive files have been anchored, I'll begin the topic index, starting in July 2000. I'll announce the major milestones here. I don't know how long it will take. So far, it hasn't been so bad, but 2000 was a short year for Contra, without a lot of photos. We'll see. I've spent the last couple of days hanging out with Renderman and Panthera from the NetStumbler forums, while they take a short break on their road trip to DefCon in Las Vegas. They found Colorado Springs a great place to visit (at least once the rain stopped) but had a certain difficulty navigating around. Now I don't feel so bad; Carol and I were getting lost for months, and still need a couple of maps to be sure of getting where we're going if we haven't been there before. One problem here is that streets change names without rhyme, reason, or any warning at all. 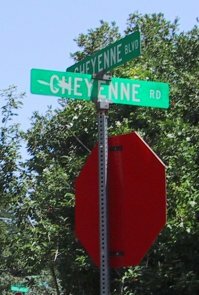 Another is that there are umpty-ump reasonably major streets with "Cheyenne" in the name, some of them just a couple of blocks apart. We were coming back from a quick hike up the Helen Hunt Falls trail, when we came upon the street sign at left. The photo isn't the best (I had to stop the car in the middle of an intersection, jump out and get the shot before any other cars turned up behind us) but our problem should be obvious. how many megajoules do we use when we sleep? Because I do, of course. I don't much care for MS Outlook because of its numerous security holes, but to be fair, most people I know who use it do so because it's what they're given to use at work. Some people take it home and make it their home email client too, using IMAP to sync folders between the two locations. However, if you must use Outlook, there's a great free product called OutClass, which installs as an Outlook plug-in, and invokes the POPFile classification engine to sift spam from ham. You need at least Outlook 2000, and certain features don't work unless you're running Outlook 2002 or 2003. With OutClass acting as the gateway to POPFile, you don't need to fool with POPFile's rather clunky Web-based UI screen. Anything you need to do in POPFile you can do from the several buttons in the OutClass toolbar. The best thing about OutClass is that it allows you to use POPFile with non-POP mail servers. OutClass can apply POPFile's classification features to any mail that can be made to download into Outlook, be it from POP3, IMAP, or Exchange native servers. So if you're stuck with Outlook, OutClass gives you a fighting chance in the spam wars. Highly recommended. Roger Schlafly (who worked at Borland when I worked there, and wrote about weird floating point concepts like denormals and un-normals in Turbo Technix) has a very good blog focused on judicial activism, and if that's a topic of any importance to you, it's worth checking on a regular basis. I consider that the second most serious flaw in the American politican system (right behind big money distorting elections) and Roger definitely seems to have his finger on the pulse. If you're not interested enough in judicial activism to read Roger's site, definitely take a look at the link he aggregated, citing a study showing that the sun is actually warming up, which may account for some of our global warming, or at least some of the recent years' violent weather. This is nothing new, of course, and I've mentioned it before, but it's nice to see it remain in the public eye. There's more to this issue than SUV's, and we definitely need to start building wind, solar, and nuclear plants in quantity so we can burn less carbon. A hotter sun can take some of the blame for global warming, but it also gives us less wiggle room if we intend to minimize humanity's contribution to the effect. Roy Harvey sent me a link to Norsam's High-Density Rosetta product line. Rosetta is an answer to the question of preserving information across deep time; that is, thousands or millions rather than merely dozens of years. It's basically electron-microscope microfiche: Using ion-beam micromachining techniques, Norsam can place 196,000 pages on a plate of nickel alloy about 2" square. The information is recorded as ordinary text, not any kind of computer code, and it's intended to be read visually, by humans, using appropriate magnification. (Norsam can create a less dense version that can be read through an optical microscope.) Very cool stuff, and we should place these in a box next to The Clock of the Long Now, a project conducted by the Long Now Foundation. The basic mcguffin in The Da Vinci Code is far from new; there's almost nothing in it that wasn't in Michael Baigent's Holy Blood, Holy Grail, which was published in 1983, and which I read in 1987. I'm trying to figure out why the damned thing is so popular. It was an eye-roller in 1987, and it makes no more sense today. If anybody has any thoughts, I'll integrate them into my upcoming general discussion. Ken Prunier sent me a pointer to Grokline, a site that attempts to apply open source principles to the law. I need to read it a little more closely to fully grok what that means, but their big project is easy enough to understand: Grokline is gathering a sort of living history of Unix, right back down to its primordial origins at Bell Labs. The idea is clearly to create (as Ken put it) SCO repellent, and if the SCO nonsense persists in our courts, the Unix community may be able to help knock it out, by documenting how Unix evolved and who did and owned what, by the people who were there and did it or saw it happen. I myself was not involved anywhere along the way, but if you were, I powerfully encourage you to contribute. Consequence-free lawsuits brought by people who seek to collect judgments as a profit center (which is what the SCO guys are doing, in my and many others' opinions) are a key flaw in the American system of government. We may not change that in terms of the rule of law (and certainly won't if we elect trial lawyers like John Edwards to positions of power) but I think we can make the SCO effort go down in flames. Help if you can. Nothing remarkable about that; I was taught it as a kid, and only caught on much later to the fact that irrespective of lip service paid to this formula (promulgated in final form at the Council of Chalcedon in 451) modern Roman Catholicism is heavily Manichaean, with a strongly implied docetism, the position that Christ was purely divine and completely spiritual. Docetism holds that His humanness was an illusion provided for us through the power of God to make the whole redemption thing more believable. Incarnational theology emphasizes the genuine physicality of Christ's humanness without diminishing His divinity. It brings the formula of Chalcedon ("True God and true man") back into balance. It does more than that, and this is the delightful part: Incarnational theology teaches that it wasn't just we who were redeemed by Christ's sacrifice, but all of physical creation as well. It gives the lie (finally!) to Manichaeism, which claims that all matter is inherently evil. So not only are we on the road back to reunion with God, the road is on the road as well. As I've said many times (mostly from personal conviction stemming from my weird borderline mystical intuitions) God will not settle for partial victories. He made it, He turned it loose, and sooner or later He will get it all back. I haven't found a good book yet on incarnational theology (what I present in this entry has come from conversations with our pastor and deacon) but when I do I'll review it here. This has been an outrageously busy week here, so my entries have been a little sparse, and I haven't been doing much original research. (Also, some spectacular lightning storms have had my systems here powered down almost as much as up, which is tough when you're trying to get a book written!) Anyway. Pete Albrecht sent me a link to this story which recounts how that oh-so-righteous dude Michael Moore asked permission to use the old Who song "Won't Get Fooled Again" in his anybody-but-Bush agitprop and got rebuffed by the venerable Pete Townshend, whom he proceeded to slander as a bully and a war supporter. Oh, the high dudgeon! The intrigue! The total lack of concern for anybody's principles but his own! Note to Democrats: If you don't yank this FT's leash soon, I'm voting for George Bush, no matter how much I dislike him. If Moore is your pitchman, you'd better be prepared to take the consequences. The Undecided Middle is bigger than you think, and we hate this kind of crap! I have always liked book publisher John Wiley & Sons; after all, they've kept my Assembly Language Step By Step in print for over 12 years now, which is almost unheard of in computer publishing. However, this morning I learned that they are cloning Degunking Windows with a title called Cleaning Windows XP for Dummies. (Wiley bought the Dummies brand from Hungry Minds a couple of years ago.) This is in keeping with my remarks on BEA from my June 6, 2004 entry, in which it was clear that all the large houses, including Wiley (alas!) have been reduced by their bean counters to selling the same old crap, and cloning the successful innovations of smaller houses. It may work; the Dummies brand is probably the best known in computer publishing right now. On the other hand, by the time their get their first clones on the street, we'll have four or five in print, and with any luck at all we'll be able to hold the line against major-league cloners. (I suspect Wiley is only the first of many. McGraw Hill is famous for this sort of thing, and I'm sure they'll weigh in with their own clones eventually.) Yes, it's sincere flattery. No, I'll fish for compliments somewhere else, thank you. Although I'm dubious these days that there are alien intelligences elsewhere in the universe, when I was younger I loved aliens and wrote lots of SF stories about them. Aliens had to had to have names, and you couldn't just name them "George the Alien." In high school I used a truly scurvy trick to name my aliens: I used the last names of my Eastern European classmates, only occasionally modifying them to make them sound more "alien." I had aliens named Czuchra and Bajh, who were also guys in my freshman year wood shop. I tweaked the name "Hrypich" a little, and morphed it to "Hkrepats," and made up a few others from whole cloth, like Lrox. My high school classmate Pete Albrecht (who was not in wood shop with me and thus never had his name given to one of my aliens) pointed me to a guy online who has done the same thing, only in the Rebol language. Alien Names is a lot of fun, and I might even use it if I were writing SF about aliens these days. On the other hand, if I ever change my mind, I can always summon Czuchra, Hkrepats, Bajh, and Lrox from my trunk and make them live again. Bob Halloran wrote and reminded me of a book I had noticed sometime back and then forgotten about: James Surowiecki's The Wisdom of Crowds. CNN published a decent article summarizing the book's theme, which is that there is a sort of "collective wisdom" underlying decisions made by free markets and other "crowd decisions" like counting jellybeans in a jar. As the 19th century mathematician Francis Galton discovered, no single person is likely to come close to the precise number of beans in the jar, but if enough people hazard an educated guess, the average of all the guesses generally comes extremely close to the true count, and almost always closer than any single guesser. I'm going to order the book and read it, but I vaguely recall somebody trying to set up some sort of a system called (I think) a "delphic poll," an idea that I think may have originated at Rand, but was popularized by John Brunner in Shockwave Rider. The purpose of a delphic poll is to predict the future through an opinion poll. How well it works I'm not sure, but I would guess not very well. The future is truly an imponderable. Nobody can get their heads around it, so our guesses are just thatpure fantasy, colored by wishful thinking and the various biases of our education and culture. No, let's go back to those jelly beans in a jar, or things like ox weighings, which were English country fair events in which people would try to guess the weight of an ox and win a prize. Again, Francis Galton found that the average of people's guesses would come much closer to the true weight of the ox than any single guess. This sort of thing fascinates me more than predicting the future, because there is a visible anchor to the guessesthe ox, or a jar full of beansand mathematical analysis has some chance of distilling something useful from the data points gathered from guessers. How about this: An artillery piece aimed by gunsight, with five sights lined up behind the gun. Five marksmen aim the gun, and the gun takes a spatial average of their sightings. Would the accuracy of five expert marksmen averaged together be better than that of a single marksman? Ahh, serendipity! I googled on the string "flyspeck squad" (don't ask) this evening, and, weirdly as always, hit #6 was a short paper on the Flynn Effect, of which I had not heard before. Back in 1980, a New Zealander named James Flynn noticed that IQ scores are slowly but steadily rising over the years. Each decade we seem to get about three IQ points smarter. Flynn did a great deal of additional research, and published it as The Mean IQ of Americans in 1984. This doesn't mean that individuals are getting smarter; if you tested at 100 in 1964 you're probably still at 100 in 2004. Young people who are tested for the first time in 2004, however, seem to have an average 15-point jump over their parents' generation. Carol was flipping through a fashion mag the other night, and I heard her say, "Wow, gluon bras are getting really popular!" Gluon bras? Suitable attire for a boson's mate? Fashion is kind of a quarky thing, I guess. Fort Carson is a little less than two miles east of us, and the base has begun playing taps at 10:00PM every night, through some kind of amplified systempresumably loud enough so that the entire occupied northern end of the (huge) base can hear it. We hear it very distinctly if we leave the sliding glass door to the bedroom deck open. I kind of like it, but if we hear it this loudly from two miles off, it makes you wonder how it sounds at the little subdivision right across Highway 115 from the base, where we lived while we were having this house built. To put things in perspective, our current 5-inch gun has a muzzle energy of 10 megajoules. ... In contrast, naval rail guns will achieve muzzle energies from 60 to 300 megajoules. ... Research indicates that a notional first-generation naval rail gun could deliver a guided projectile with an impact velocity of Mach 5 to targets at ranges of 250 miles at a rate of greater than six rounds per minute. I've always known that vitamin B-12 (cobalamin) was difficult to absorb through digestive tract walls, or even mucous membranes, which is why people with serious deficiencies (and many otherwise healthy older folks) take it via injection. Finally I found out why: It's an immense molecule, with this great big honking cobalt atom at the center of it. (This otherwise so-so article contains a nice drawing of the molecule. Scroll past the vegan rants to the illo.) Some people squirt the stuff up their noses to be absorbed through thinner membranes there, but I'm not quite ready for that yet. However you choose to take it, let me reiterate that sublingual B-12 has done a lot to relieve my late-in-the-day fatigue, and if you're in or past your 50s it's worth a try. A reader asked me earlier today if I could begin putting named anchors on each of my entries here, so that it's possible to link directly to an individual entry. I've been meaning to work something out like that for awhile, and the idea I had ages ago and never pursued was a simple Delphi app that responded to a hot key (like alt-F11 or whatever) and when invoked would generate a named anchor via a selected algorithm and drop it into the text at the current cursor position. Ideally, I would create a context menu that would appear when a position on the screen is right-clicked, allowing the selection of a type of named anchor to insert at that point: #top, #bottom, #<current date>, #<sequential number>, #<sequential date>, and so on. Putting in named anchors containing the date (like #07-12-2004) isn't a huge burden when doing entries day by day, but I have well over a thousand entries in my archive, and I'd like to add named anchors to them as well, so that I could finally publish a click-to index of topics. This would require something very quick and thoroughly automated or I couldn't justify the time it would take. Building such a utility wouldn't be a hellish amount of work, and it would be fun to try, and very useful once perfected. But before I spend a whole lot of time on it, has anyone seen a utility like this? By the way, I've begun manually placing named anchors at the beginning of each entry. I now have tags at the beginning of all May-July 2004 entries, and will go back further into the archives as time allows. (An automated anchor-generator utility would make it go a lot faster.) The format I'm using is mm-dd-year; for example, #07-12-2004 for today's entry. Years will be full, 4-digit values. Single-digit month and day values will be preceded by zeroes. The anchors are invisible unless you display page source, but they're there. However, don't mount permanent pointers to named anchors in this file! After three months, entries leave this file in month blocks and are placed in separate month archives. At that point you can mount permanent pointers to entries in the month archive files. For example, the file september2003.htm never changes after it's created, but this file (Diary.htm) changes constantly, and every month the oldest month drops off the bottom and the new month is added at the top. It's not perfect, but it'll do for now. Suggestions and ideas always welcome. All these do in fact yield my Web site when searched for on Googlesomebody needs to teach these people the value of quotation marks in Web research. The last one stopped me cold, since the #1 hit on Google is in fact my October 2002 Contra archive. (Try it!) "Mount Caramel!" Sweet! And this was all from the first 48 hours that the domain was being tracked! My Interland hosting service account is now cancelled. It's possible that this happened before all the world's DNS servers changed from the old Interland IP to the new one, and some mail may be bouncing out there. If you're getting back mail sent to my old address and you're reading this, change to the new email shown as a bitmap in yesterday's entry. It's significant that I got only 21 spams this morning rather than my customary 170 or so. Something happened, and I can't tell just what yet. 'Nuff of that. I'm researching something today: Ethernet intercoms. Our house is big, with my office upstairs and Carol's office downstairs. I'm trying to find a program that will allow us to use the 100BaseT Ethernet network in the walls to allow one of us to call the other through our computers. I downloaded OfficeIntercomm but can't get it to work correctly. Any other suggestions? As a fallback I'll just have Carol get a Skype account and use that to reach mebut I thought if there were something that worked over a LAN without requiring the Internet, I would try it. In the meantime, I found a nice general page on intercoms, which covers almost everything except Ethernet-based LAN intercom programs. The page brought back some memories: When I was 11 I built a 2-way intercom in a pair of cigar boxes, and we used them to connect our tent with another tent at Boy Scout camp in Michigan. People kept tripping over the wire but it was a lot of fun and kept us up half the nightnot like that's hard at camp. My own ISP's DNS servers flipped last night, so I'm pretty sure most of the world is now resolving duntemann.com to my new hosting service. I'm going to call Interland a little later today and cancel the account there. I'll continue to read the duntemann.com address for a couple of months to catch the inevitable stragglers, but I will only be replying using the new address. If you're reading this, that means you're reading the copy of Contra based at my new hosting service; the copy back at Interland ends at July 7, 2004. I'll be cancelling the Interland account completely on the 10th, and I'm hoping that by then the changes to DNS will have propagated almost completely and we'll be done. As of this morning, about a quarter of my email was coming to the new server, so I know that the changes have begun percolating around the world. I'm about to change DNS for duntemann.com. My Web site is now live in both places, though I'm moving my Wi-Fi Guide Online to a separate domain, and that hasn't been done yet. I'm not sure what the DNS change is going to do to duntemann.com email while it's in play, but I have another email for you to usein fact, this may become my primary email in another month or two, after I finish writing Degunking Email. See the graphic above, or simply append "jduntemann" to "copperwood.com" with that funny little round symbol in between. I may not post another Contra entry for a couple of days while I get this whole thing moved over and debugged, so bear with me and don't worry. After 48 hours, we're still #1 on Amazon's Computers & Internet list, and #13 on the full stack rank. Still freaking amazing. But other business presses. Today I begin the process of moving my entire Web site from one hosting service to another, after being where it is for almost seven years. The actual moving of files won't take all that long, but what worries me is getting DNS on the domain transferred. Michael Covington had a lot of trouble with this when he moved his hosting recently, so I'm expecting the worst. (This won't be working until tonight at the very earliest, and I recommend against using it unless you try duntemann.com and it doesn't work.) Under my new hosting service, my domains will all be physically under the copperwood.com domain, in subdirectories that will be aliased directly to a domain. So even though duntemann.com will be in a subdirectory under copperwood.com, you'll be able to enter www.duntemann.com and go right to it. The copperwood.com domain stands for my personal services corporation, Copperwood Associates, and Copperwood Press, which I hope to (finally!) kick off late this summer. Kris Sotelo will be building me entirely new page templates, and it will look nothing like it does todaythough that's still a few months off. More on the yesterday's coup of getting a quarter-page review of Degunking Windows on page 11 of Parade Magazine. In 24 hours, the book's ranking on Amazon went from 17,989 to....4. And that's on the entire stack, not just Computers & Internet. It is to boggle. Then again, when 20-25 million people see a favorable review of a product, you can't help but sell a fewor maybe more than a few. Why only 20-25 million and not 35 million? We learned (after many of you wrote to tell us) that the review did not appear in every copy of Parade that was distributed yesterday. We then understood what Parade had quietly mentioned some time ago, that the review occupied a spot that might be sold for regional ads, and if no ad was forthcoming, the review would appear. My tireless co-author Joli Ballew did some spot-checks, and found that no one in Syracuse saw it, but everyone in Denver did. In Dallas (her home town) about 2/3 of Parade's printed copies carried the review, and 1/3 carried an ad. About half the people in Tampa got copies with the review. So our figure of 20-25 million is an educated guess as to how many copies of Parade actually went out with the review. That's still an enormous number of people, and we're fairly sure Amazon ran through their entire remaining stock of the book in this one day. (Lots more in the warehouse, though...) We're extremely interested in seeing how long the pop lasts. Parade reaches a lot of people, but we're fairly sure it doesn't sit on the coffee table as long as a copy of, say, The Atlantic would. We're keeping a close eye on it (duh!) and I'll give you a recap in another week or so. In the meantime, whoopee! Hokey smoke! What a thing to wake up to on the 4th of July! I hauled in the ten pounds of Sunday paper just now, and after a quick cruise through the comics, I picked up Parade Magazine, which I usually get through in about thirty seconds. ("Marilyn Vos Savant." VosfoxSavantvery smart. Yeah, right. Of the Boston Vos Savants, no doubt.) But there on page 11, in Robert Moritz's "Gadget Guide," is a quarter-page review of Degunking Windows. It's not a lot of text, but there's a b/w cover shot, with a caption that says it all: "This book tells everything you need to knowin language you can understandto get your old PC back in mint condition." Parade distributes 35 million copies every week, and has the largest circulation of any magazine published in the US. One can argue about how many of those copies are actually read, but still...in all the time we did Coriolis we never got any PR with nearly this much audience. POPFile glitches and hands me a false positive every so often, but it's been by far the most accurate thing I've tried yet to catch spam. POPFile's success has not been lost on mail client vendors, and I'm starting to see built-in Bayesian filters appear in mail clients. Poco Mail 3.1 (which I use) has a new Bayesian filter, as does Mozilla Thunderbird. The Bat has a Bayesian filter plug-in, but I've had serious problems with it. All are quite early and will need some time to mature. What was interesting is the gap in performance. I ran a lot of mail through Thunderbird (leaving it on the server so I could then run it through POPFile as well) and its Bayesian filter never got over 90% accurate. (POPFile is now standing at 99.6% accuracy, though as I mentioned in my June 27, 2004 entry, large quantities of spam correctly captured can make the numbers sound better than they really are, if false positives are your primary concern.) I was expecting that all Bayesian filters would yield roughly the same accuracy on the same corpus, and this clearly wasn't the case. I set it aside as an imponderable (one that I didn't have time to chase down right now) but today I stumbled across what is probably the explanation. John Graham, who wrote POPFile, published his PowerPoint slides from an anti-spam conference in 2003, in which he explained a number of scurvy spammer tricks and how POPFile gets around many of them. POPFile reads domain names as words, allowing HTML messages that contain no "real" text (just IMG tags pointing to images) to be identified as spam. POPFile tracks the background color used in text, and where the background color is the same as the foreground color (making the text "invisible") it discards the text so that the text will not skew the model. POPFile parses HTML, and will ignore any tag (including comments) that is ignored by the browser. This allows it to get past spammer dodges like placing nonsense tags or comments in the middle of words: "cele<gobble>xa" or "cele<!-- gobble -->xa"
POPFile strips out punctuation and spaces within words: "M*o*r*t*g*a*g*e"
I laughed at the cleverness of a spammer technique I had not seen before reading of it in the presentation: Spammers have begun using monospace fonts and HTML tables to divide horizontal text into vertical stripes, which are not readable until the browser renders the message. POPFile isn't clever enough to catch this one yet, but from the presentation John's obviously aimed in the right direction: Spam filters must also be HTML renderers. In other words, what the filter sees must be identical to what the human reader of a message sees. This is crucial, and something I've been saying for a long time. We're not quite there, but John's stated intention is to get there eventually. In the meantime, as a spamcatcher nothing comes close to POPFile, which is free and (relatively) easy to use. Get it! An article in today's Wall Street Journal highlighted something I have long suspected: That local governments are getting around voter-imposed restrictions on raising taxes by devoting ever more of Police resources to enforcing minor traffic lawsand regularly raising fines as people increasingly comply, to keep the money flowing in at a steady rate. Here in Colorado Springs, city government imposes insane quotas on the cops (whom I don't blame; they're just following orders from the pond scum running the city) who then basically sit at the bottom of hills, passing out $100 fines to people going six miles over an artifically low speed limit. There are six-lane roads here with a speed limit of 30 miles per hour, all done (as with everything else) "for the children." Colorado has a relatively strict tax-limitation amendment to the state constitution called TABOR, (TAxpayer's Bill Of Rights) and the great game for politicians in Colorado is either attacking TABOR ("for the children," always) or developing sneaky ways to get around it. Speeding tickets have become a sort of bake sale to augment city spending. It's one of the few forms of law enforcement that actually turns a profit for the city. Police don't mind too much, because speeders generally don't shoot at them. I'm ranting here because in our neighborhood, there is a handful of young fools who have been defacing mailboxes and throwing eggs and toilet paper at houses. We got nailed a month or so ago, and I think it might be a better use of police man-hours to cruise the neighborhoods rather than sitting at the bottoms of hills pulling in money for the city's general fund. Colorado's constitution is relatively easy to amend via initiative (like California's) and sooner or later someone will float an initiative requiring that cities turn over traffic law fines to the state's general fund rather than keeping it locally. Without an incentive to raise funds for the city, the police may be allowed to do what we want them to do, which is to patrol the city and prevent mayhem. It'll happen. (Recall how the IRS ceased auditing middle class taxpayers once public anger rose to the extent that politicians began speaking of "tearing the income tax out by the roots.") Just watch.